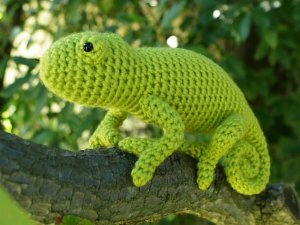 An original realistic crochet amigurumi Chameleon lizard pattern by June Gilbank. Chameleons are probably the most fascinating of lizards because of their unique physiological adaptations: large eyes with fused, independently-swivelling eyelids; amazing Y-shaped feet to grip onto branches; a prehensile tail; and a tongue as long as its body with a suction cup on the end for catching insects. You'll find all these features (except the tongue) in my pattern! Additional info: You'll also need 6 pipe cleaners to make the legs and tail poseable. The ends of the pipe cleaners are protected, but please be sensible and don't use this as a baby toy unless you skip the pipe cleaners (tips for how to omit them are given in the pattern). Date Added: 04/26/2018 by Sara B. Date Added: 02/18/2017 by Francesca B. Date Added: 06/05/2013 by Sheryl W.
Date Added: 03/25/2013 by Sara J. Date Added: 02/15/2013 by channing l.
Date Added: 01/26/2013 by Simone N.
Date Added: 09/29/2012 by Etha S.